Like most American auto manufacturers, Plymouth and DeSoto returned to peacetime projects after World War II with somewhat upgraded 1942 models, though in DeSoto’s case the changes were fairly significant. 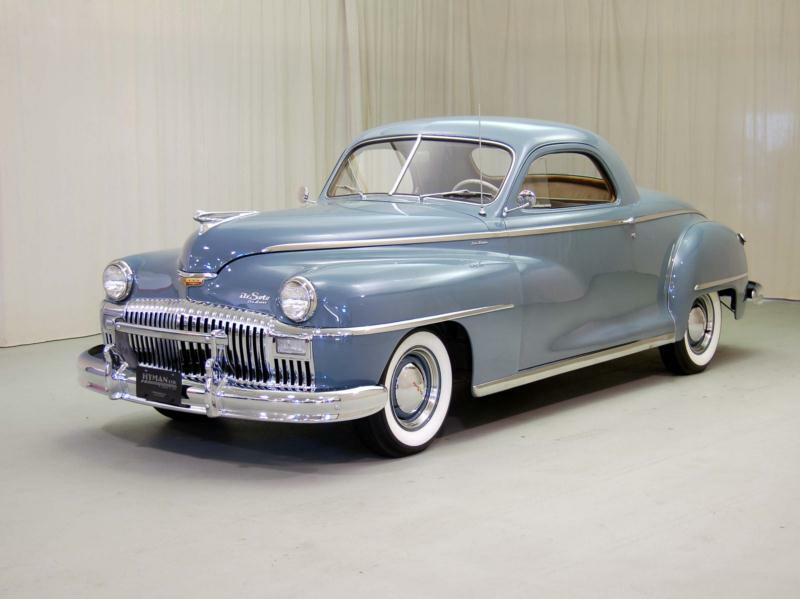 For one, the 1946 DeSoto lost the handsome hidden headlights, which meant front fenders had to be reworked, and the waterfall grille was modified to incorporate park lights. Rear fenders covered more of the wheels, and bumpers were wrapped further around. Mechanically, some wartime expertise was incorporated by including new aluminum pistons and a rotary oil pump with airplane oil filtration for the traditional 236 cubic inch, 109-bhp L-head six-cylinder engine. A three-speed transmission was standard, but the buyer could vouch for an optional fluid drive, otherwise known as the Tip-Toe Hydraulic Shift. The four Deluxe and seven Custom models would change little in the next three years, until the full-width body was introduced during the 1949 model year in December. Sales had risen steadily, with 62,368 cars in 1946, 82,232 in 1947 and 93,369 sold in 1948. The most monumental model in this period was the ubiquitous taxi, seen in every musical at the time. In the Deluxe line, 11,600 taxis were delivered in 1948, and would remain in service for years. In keeping with other manufacturers, DeSoto introduced a full-width line in 1949 and the Deluxe got a woody wagon for one year, of which only 850 examples were built. Total Deluxe sales were 23,495 out of 107,174, the remainder being Custom models. For 1950, Deluxe sales roles to 33,327. The woody wagon was replaced by a long-wheelbase Suburban, though only 235 were sold, and taxi business contributed 2,350 sales to the Deluxe line. For 1951 and 1952 the taxi business continued to be a strong part of the DeSoto Deluxe line with 3,550 long wheelbase California taxicabs sold. The big news for 1952 was Chrysler’s launch of the DeSoto Firedome series with a 276 cubic inch Hemi V-8. In 1953, the Deluxe and Custom lines would be dropped in favor of the V-8 Firedome and six-cylinder Powermaster.